I have received a call from BuffWear in the UK, who have offered to help us out with t-shirts, shorts and Buffs, of varying colours and types. 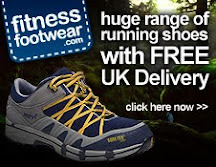 Again a very generous offer, and I usually wear Buffs on my runs and bike rides and always take them in my kit bag. Am looking forward to running with the Polar Buff in the depths of winter, as some caps aren't warm enough and some beanies are too warm, so this should be a great compromise. They have also offered to add us to their website with a link to a Justgiving page and also a link to the Buff news at their HQ in Spain, as well as covering us in Twitter and Facebook, so need to get our contract signed and then get a few pics of Alex and myself kitted up and put them on here as well as pass them on to Buff. Next up is the Henley ½ at the end of this week and the start of the Challenge. Monday October 12th We have an interview with BBC Berkshire and a chance to sit down and sort out our tactics. Not too bad a week just gone on the running front, half-hearted taper and missed Sundays run, but this week will be easy, with a couple of longer runs in the morning, without pushing too hard. Still hope to hear over the next few days about London Marathon entry. Alex and Mandy have both been unsuccessful, and I don't want to make it 5 in a row, having been turned down 4 times already by the Ballot system. Still to apply for Brentwood and the 2 Ultra's in January/Feb, but plenty of time for those and will apply for Brentwood this week. Finally i have joined Dailymile, a new website that allows you to log your runs and compare and chat with runners all over the world, alomst like a specialist facebook site for runners. Nice way to meet other like minded people with a common interest.